We have added a new feature to our website: for dogs we have sequenced, we are now returning breed mix results on their profile page. Please note: We are missing a handful of common breeds, like the American Pit Bull Terrier, in our breed reference panel. If a dog has ancestry from one of these missing breeds, we won’t be able to detect it accurately. We’re adding these breeds, and will update results for all dogs within the next 3-4 months to reflect these additions. Darwin’s Ark welcomes dogs from all different types of backgrounds. We have everything from purebred beagles to pure mutts to street dogs from Africa, and we know that we’re not going to get it right for every dog. Our new Breed Results section shows what we found, and asks for your feedback. In this blog post, we will walk through the Genomic Breed Mix results and what they mean, as well as some of the science behind breed calling (you can learn more in this IAABC article). When you navigate to your dog’s page via My Laboratory, you can find your dog’s Genomic Breed Mix. If your dog doesn’t have results yet, you can see the results for one of our very first participants, Jenny. As shown above, we share a picture of the most prominent breed in your dog’s DNA, and briefly describe what we think your dog’s ancestry is. We also show a circle plot of your dog’s full breed profile. You can hover over “Others” for other breeds detected at smaller percentages, as well over “Unknown” for a description of what that means. Puppies come from when a mother dog and a father dog get together and… each contribute half of each pup’s DNA! Since each dog actually inherits two slightly different versions of their DNA, one from their mother and one from their father, our first step is to try and disentangle the two versions, a process called “phasing”. We then test each version of the DNA for ancestry by dividing it into thousands of different segments. We compare each segment to all the breeds in our reference panel and find the breed that it matches most closely. By adding up the sizes of the chunks that match to a given breed, we can estimate that breed’s contribution to the dog’s overall ancestry. Our current reference panel is made up of ninety-three of the most popular dog breeds in the United States (95% of American purebred dogs are one of these 93 breeds). Putting together a reference panel for dogs is difficult because there are hundreds of breeds, and to include a breed in our reference panel we need to have genetic information for at least 12 dogs from that breed. Our reference panel is made up mostly of data produced and shared by other scientists. We also reached out to dog owners who provided DNA for a few popular breeds we were missing. If your dog has ancestry from a breed not in our reference set, we won’t be able to make a good match for the segments of your dog’s DNA that come from that breed. Why are extra breeds detected, even in dogs with purebred ancestry reported by their owner? Our breed ancestry algorithm attempts to match every part of your dog’s DNA to a breed in the reference panel. It will find the closest matches, not necessarily the correct matches. This means that some breed results don’t fully reflect the reality of a dog’s family history. One of our goals is to determine which results are accurate and which may be less trustworthy, and improving our algorithm and reference panel accordingly. What makes a purebred dog? What makes a mutt? This is a question that still puzzles scientists: where do we draw the line between pure and mixed breed dogs? A dog breed is a bit like an extended human family. Dogs in a breed are genetically related to one another, and often also must meet a standard (a set of guidelines and traits) decided on by humans. There are hundreds of breeds around the world, each with unique ancestry. How confidently did the algorithm determine your dog’s breed(s)? (Mean Posterior Probability) If all of your dog’s DNA is from one breed, and that breed is in our reference panel, our algorithm will make a very confident breed match. For dogs with ancestry from breeds not in our reference panel, dogs who have ancestry from many, many different breeds, or dogs who have ancestry that isn’t from any breed, we’ll get low confidence scores. Does your dog have low heterozygosity? (Genetic Diversity) We take a look at a feature of the genome called “heterozygosity,” or genetic variation between parental DNA. Low heterozygosity generally occurs in purebred populations because dogs within a breed are very similar across their DNA. It can also occur when mom and dad are closely related, even if they’re not purebred. Does your dog have a high percentage of one or two breeds? (Percent of Top Breed) You may see that your dog, if purebred, has a high percentage of one breed, with few-to-no other breeds detected or miscalled. If they have high percentages from two breeds, and almost no ancestry from any other breed, they might be a first generation cross of two breeds, like most goldendoodles. If your dog is a purebred dog from a breed absent from our reference panel, we might not be able to figure out they are purebred. Instead, our algorithm might detect a high percentage of unknown ancestry, or ancestry from a closely-related breed. For example, a purebred Shikoku Dog may come up as a Shiba Inu. 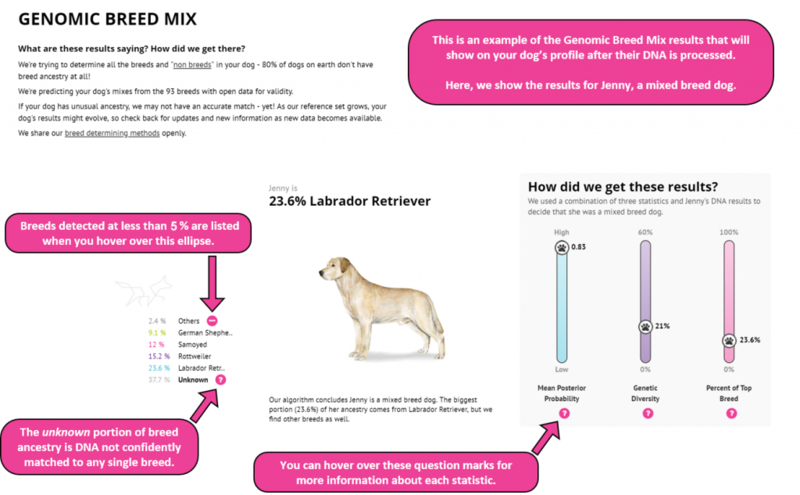 We ask you for feedback, at the bottom of your dog’s Genomic Breed Mix report, on whether your dog’s pure or mixed breed status is accurate so we can improve our algorithm. If your dog is purebred and from a breed missing from our panel, your dog could be added as one of our reference panel dogs, once we have 12 dogs from that breed. How do you determine whether the algorithm is accurate? We test the accuracy of our algorithm by generating virtual dog genomes. We start with purebred dog DNA and simulate crosses over generations on the computer. We know the pedigree history of these virtual mutts: what breeds went into them, at what percentage, and at which points recombination occurred. We then measure how well the algorithm calls the virtual dog’s ancestry, compared with what breeds went into the simulation. 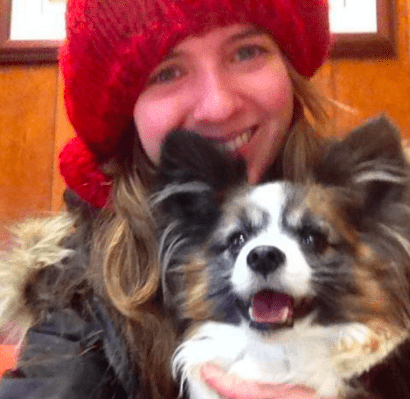 Okay, ancestry is fun, but how does ancestry help Darwin’s Dogs research? Beyond the fun of uncovering your dog’s roots, ancestry is a necessary factor in making genomic discoveries. It’s very valuable to our genomic research to represent the full diversity of dogs, across mixed and pure breeds. Human genomics and precision medicine has been facing a diversity crisis. Lack of genetic diversity and poor ancestry representation has impaired scientists’ ability to make meaningful discoveries and predict the effects of genetics on health. This problem is not unique to human genomics, and for a long time canine genomic research has prioritized studying closed purebred populations. The result is a trove of DNA markers that indicate health risks in a relatively small proportion of dogs. We want to improve what we learn from dog genetics so that scientific findings are relevant to many more dogs, of all sorts of backgrounds.